It's a small coffee shop in ...... .The perfect solution was the Ubiquiti Airrouter in this place. The coffee shop had an existing router they got from their internet service provider, this is where the WAN/internet port of the Ubiquiti Airrouter connects. In the hotspot settings of the router they enabled the hotspot service on the LAN port too, so this way they could add a PC for those guests who don't have any device. This is is a hotel in France with 5 floors. They set up 2 Ubiquiti Unifi's on each floor in a simple Access Point (AP) mode. UTP cables are hidden above the ceiling. These access points are connected to a Mikrotik wired router via switch. The Mikrotik is set up with hotspot service on its LAN ports. 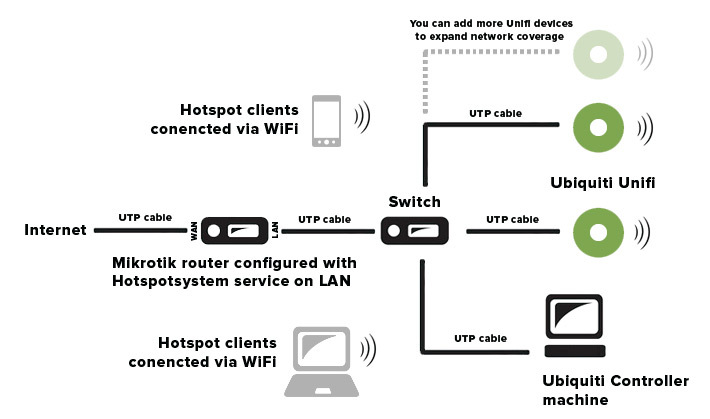 ( Mikrotik installation guide ) The main hotspot configuration is set on this Mikrotik, no hotspot configuration on the APs neither on their controllers, the access points simply connect the wifi guests to Mikrotik's hotspot network. Some of the parameters of the Unifi APs can be managed with the factory Unifi Controller like SSID, channel, mode etc. This is a large campground where the main uplink connection for hotspot routers are set up with Ubiquiti 5Ghz access points in AP-Client mode. On the top of the reception there is a Ubiquiti 5Ghz AP in AP mode with encrypted SSID, this will be the main uplink connection for other devices. On each other buildings there are 2 access points. 1 Ubiquiti Nanostation 5Ghz in client mode wirelessly connected to the main building and a Ubiquiti Nanostation 2.4 Ghz in AP mode which is providing the hotspot service. ( Nanostation installation guide ). The Nano 2 is connected to the uplink via the Nano 5 through UTP cable. Of course the lan connection between the Ubiquiti's are done through their Power over Ethernet units. 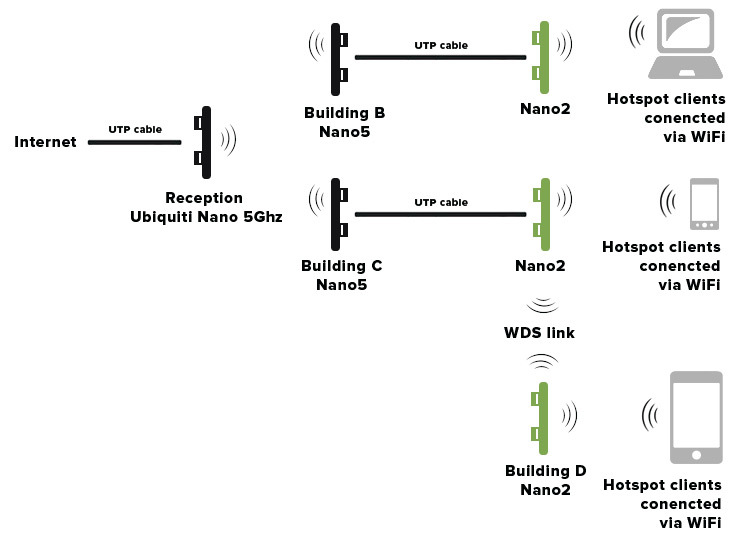 During the setup they run out of the Nano 5 devices so the connection to the 4th building was set up via direct WDS connection to the other Nano2 on the top of the 3th building.